Has wifi and reminds me of home. That’s enough. 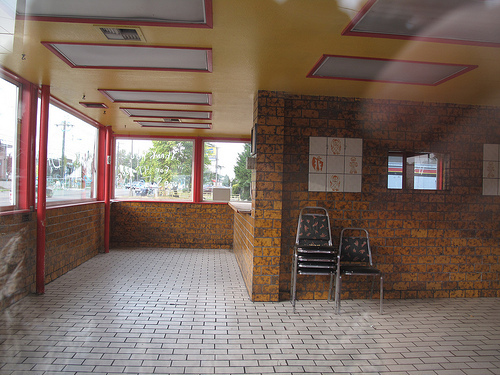 The Taco Time Building at 3855 Pacific Avenue has been vacant for some time. It is available for sale through Colliers, International. 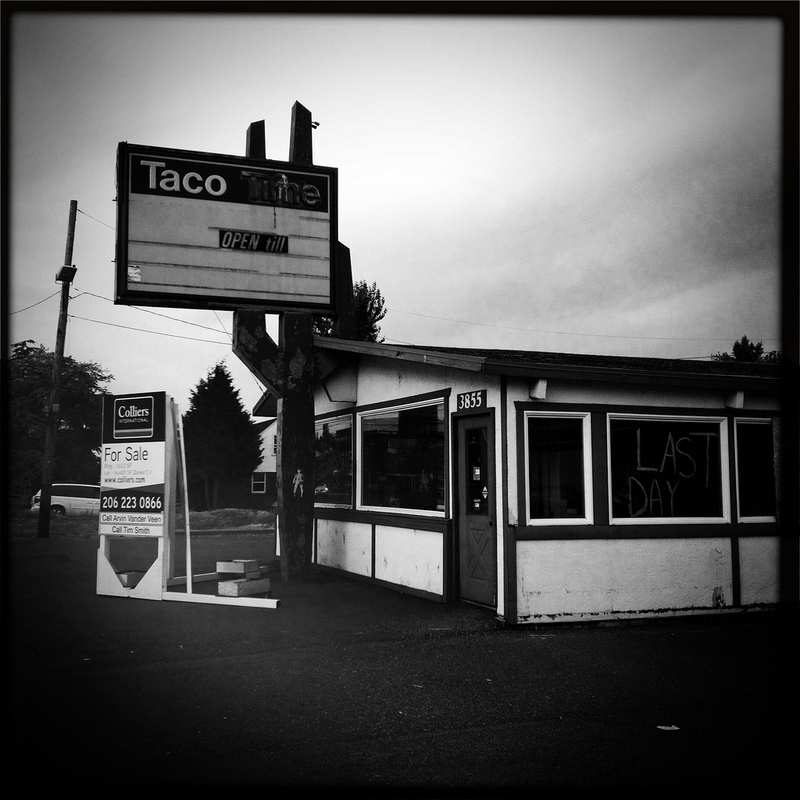 This entry was posted in Tacoma, Their future is in question, WA State - Pierce County and tagged available, for sale, Taco Time, Tacoma, vacant, WA on September 27, 2012 by admin. 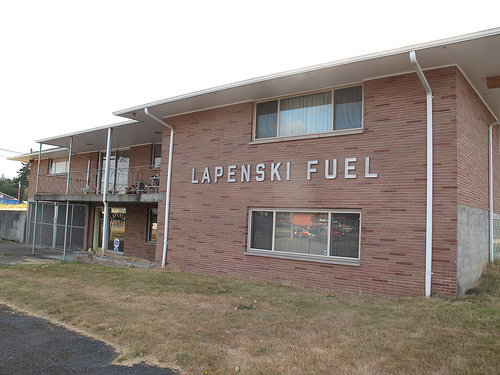 The Lapenski Fuel Company located at 9910 Pacific Avenue, Tacoma, has provided various types of fuel, wood, coal and heating oil. 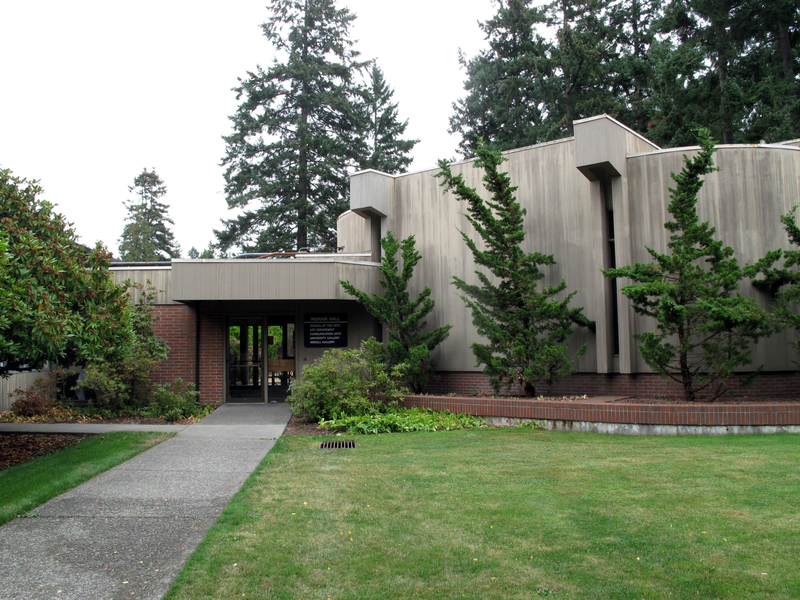 The building was constructed in 1957 and has a mid-century look to it. 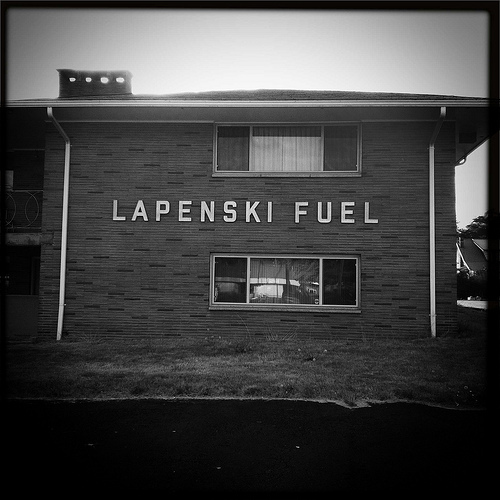 This entry was posted in Service Places, Tacoma, WA State - Pierce County and tagged 9910 Pacific Avenue, Coal, fuel, heatin g oil, Lapenski, mid century, Tacoma, wood on September 26, 2012 by admin. 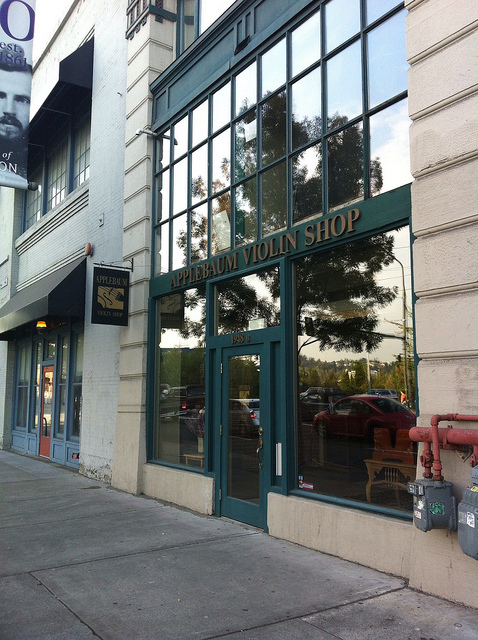 This entry was posted in Service Places and tagged Applebaum Violin, repair, retail, shop, Tacoma on September 25, 2012 by admin. 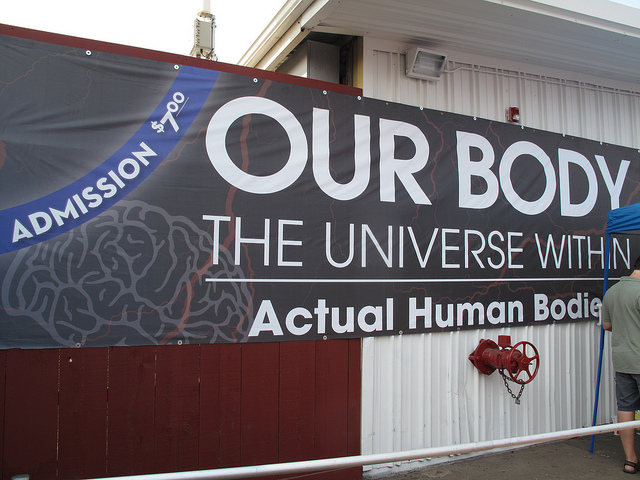 When dear daughter and I went to the Western Washington State Fair last weekend we simply forgot to see the Our Body, The Universe Within exhibit and afterward that made me sad. But, on the last day of the fair, we decided to go again. Yes, there were scones involved. I had decided not to take photos in the exhibit because it just didn’t feel respectful. Just as well since photography was not permitted, nor were cell phones. Really good photos can be found on the exhibit’s website http://www.ourbodytheuniversewithin.net/. It was a very interesting exhibit and I learned a few things. The part that captivated me the most was that they took one body and sliced it into 12 pieces sideways. So the two end pieces each had an ear and in between we saw muscle, bone, organs, etc. The individual organs were also fascinating. The stomach was smaller than I thought and the thyroid was larger. There was a brain that had been damaged by a stroke and lungs that had been ruined by smoking. The exhibit made dear daughter a tad queasy. This entry was posted in Art -- there is art here!, Once in a while events, Puyallup, WA State - Pierce County and tagged bone, fair, muscle, organs, Our Body, scoones, stomach, The Universe Within. exhibit, thyroid, Western Washington State Fair on September 23, 2012 by admin. 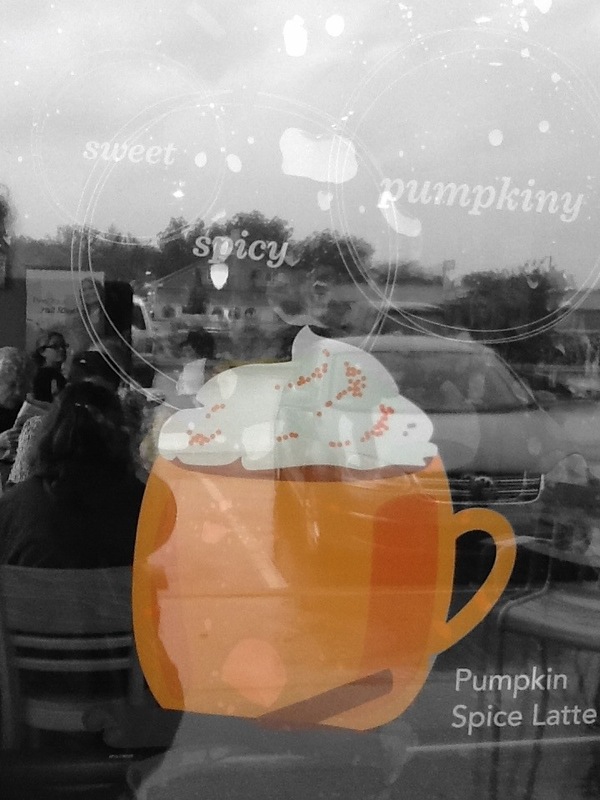 This entry was posted in Schools, Tacoma, WA State - Pierce County and tagged AAUW, college, Ingram Hall, Pacific Lutheran University, PLU, Stephanie Coonz on September 22, 2012 by admin. 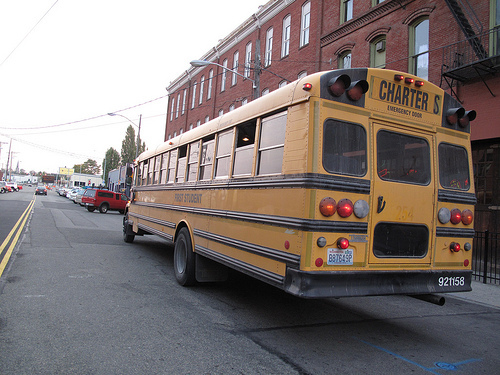 For our September Art Bus we went to Job Carr Cabin Museum (the log cabin), 253 Collective (birds and turds),Tacoma Glass Blowing Studio (the glass pumpkin), Hotel Murano’s new gift shop (the glowing canoe), Brick House Gallery (the neon sign) , Rampart / Brownie Morrison (the manikin) and Catwalk (the showroom). At Catwalk dear daughter purchase a groovy retro tie that she was enthused about. And we were treated to pizza from Puget Sound Pizza (yum!). 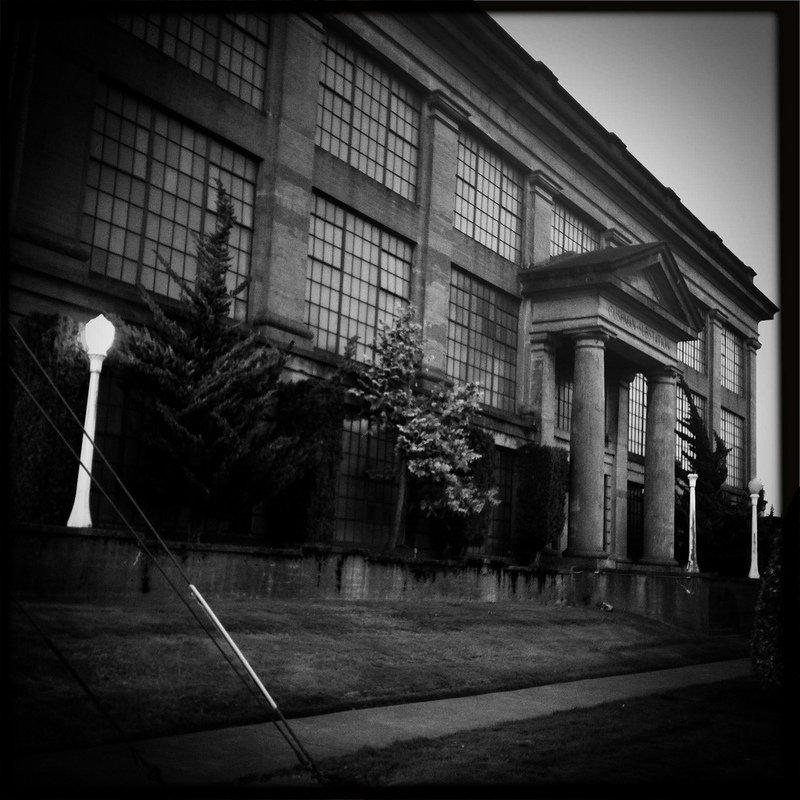 This entry was posted in Art -- there is art here!, Community Space, Museums, Non Profits, Tacoma, WA State - Pierce County and tagged 253 Collective, birds and turds, Brick House Gallery, Brownie Morrison, Catwalk, Hotel Murano, Job Carr Cabin, log cabin, museum, neon sign, pumpkin, Rampart, Tacoma Glass Blowing Studio on September 22, 2012 by admin. 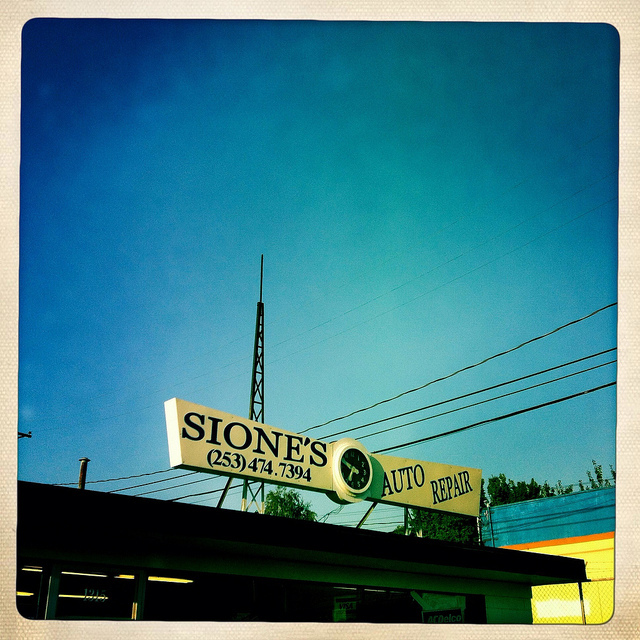 Sione’s Auto Repair at 1315 South 38th has a cool sign. The building was constructed in 1956. 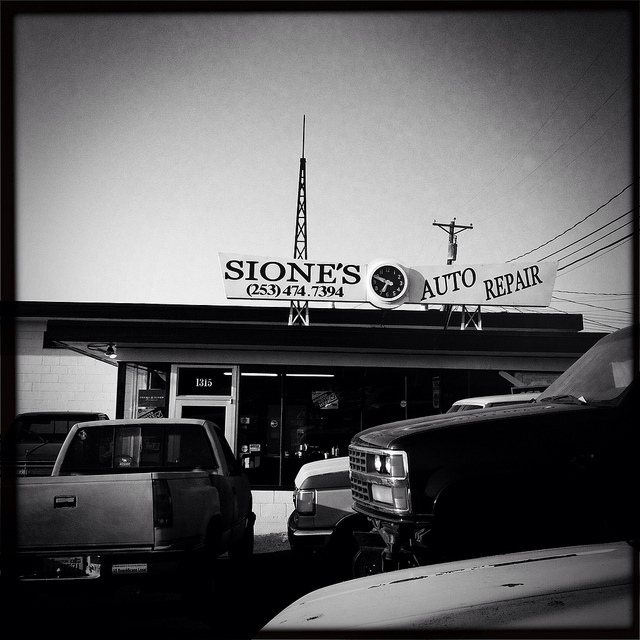 This entry was posted in Service Places, Tacoma, WA State - Pierce County and tagged auto repair, cars, clock, sign, Sione's, South 38th, Tacoma on September 18, 2012 by admin. At least nine Save A Lot Stores in the Puget Sound are closing including the one at 1105 Martin Luther King in Tacoma’s Hilltop. I remember in July 1999 when the building was a recently constructed as a Rite Aid drug Pharmacy. An entire block was demolished to make way for the Rite Aid. 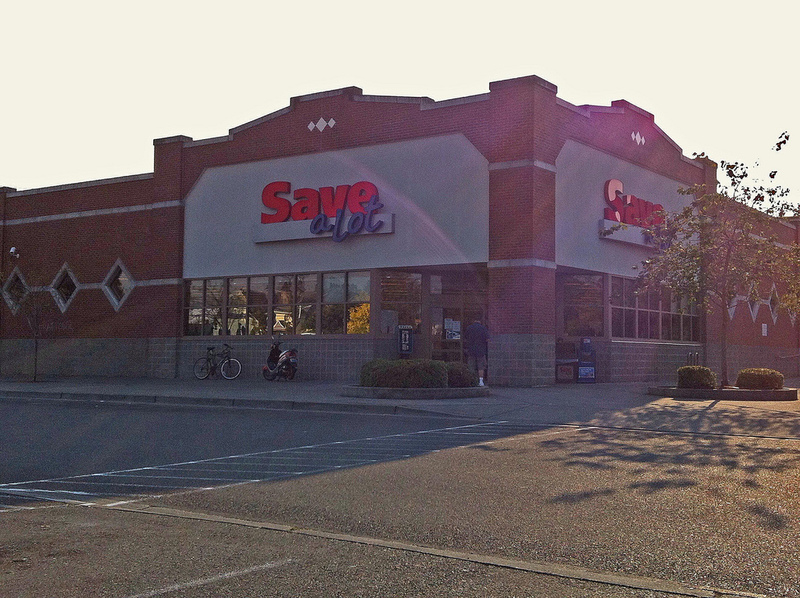 In January 2005 the Rite Aid closed and in September 2006 the Save-A-Lot Extreme Value Grocery Store opened. Larsen Pharmacy had been on the site (or part of the site) as of 1938 and Harold Meyer Drug Store was there as of 1944. Kellogg & Ford Building was there as of 1905. The J. Anton Mueller store was there in 1916. This entry was posted in Uncategorized and tagged closing, Harold Meyer Drug Store, Hilltop, Kellogg & Ford Building, Larsen Pharmacy, Martin Luther King Jr. Way, Rite Aid, Save A Lot on September 17, 2012 by admin. 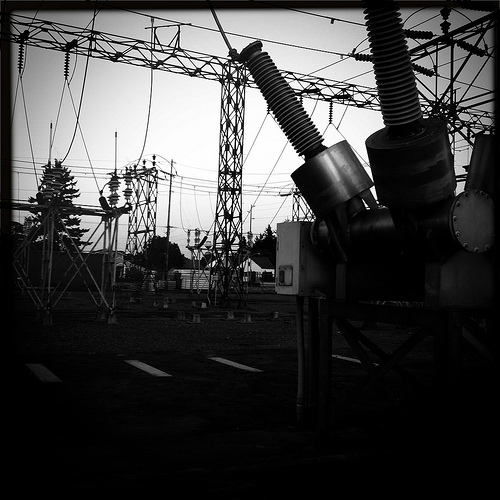 substation”. The station served as terminus for the power generated at Cushman Lake hydroelectric power project. 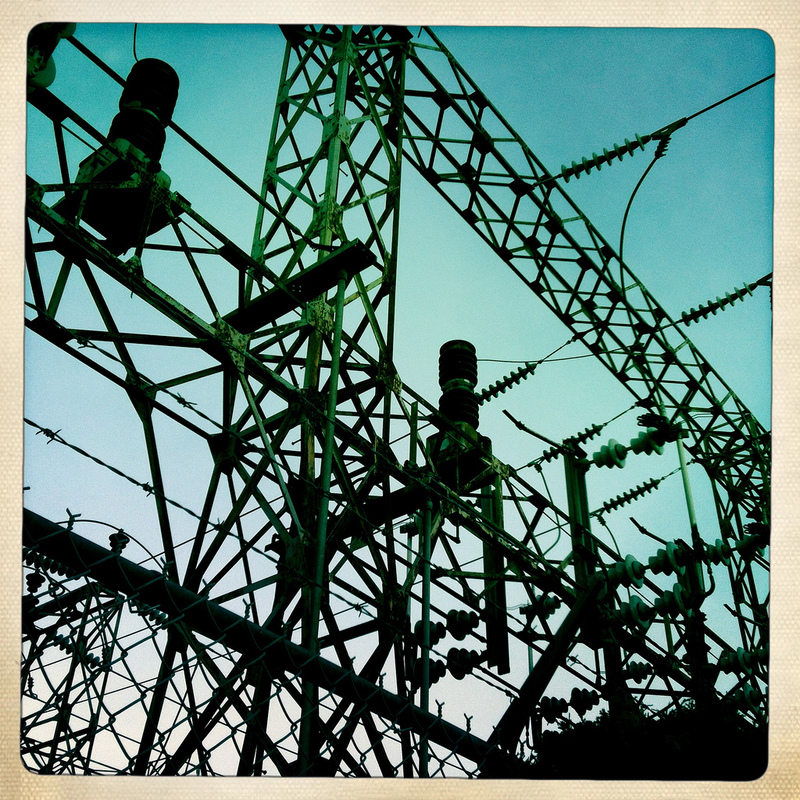 This entry was posted in Uncategorized and tagged Cushman Lake, Cushman Substation, Doric, engineers, Greek Revival, station, substation on September 16, 2012 by admin.